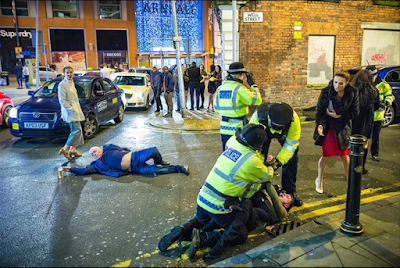 You probably remember Joel Goodman's wondrous photograph, taken on New Year's Eve 2015 and soon known as The Creation Of Manchester. Goodman's shutter clicked at the moment in which the 'characters' fell into perfect aspects and ratios that, with some glorious light, gave it a posed, painterly quality which has survived long beyond the fraction of a second for which the scene existed. I wonder if cricket now has its own version in the form of this GIF, which captures Simon Harmer's dismissal of Steve Finn at Chelmsford last Thursday. It crams an awful lot into a few seconds. As a set-up, the initial still is perfect: seven fielders around the bat and the long four-way shadows of the floodlit gloaming offer an instant narrative of a tight, late finish. Essex were about to win by a vast margin in the scorebook, an innings and 34 runs, but in reality the end came with the clock at a minute to nine pm and three deliveries left in the game. The spring had been winding tight throughout the last afternoon, when Nick Compton batted for 303 deliveries - 59 more than he'd faced all season - in making 120 and Paul Sterling summoned an unlikely three-and-a-bit-hour half century alongside him. Harmer, in blistering form, worked his way through the rest, taking the first eight to fall. Dan Lawrence winkled the ninth, bringing the Watford Wall to the crease. Those hours of tension, of the effort in the daily lives of professional cricketers, are deep within the image. It's part of the genius of the game that its great, tidal lulls are transformed into climactic moments of exquisite tension, felt by everyone. Finn picks the line as leg stump-ish. I'd guess somewhere halfway through his leave he knows he's wrong, or at least wrong enough. Perhaps the umpire feels the pull of the drama as he realises he must bring final judgement on four days' of toil. As the appeal is answered, the nine men of Essex sprint left and out of frame, a murmuration of cricketers, leaving the stage clear for the principals. Finn hangs forward, his head bowed. The umpire holds a pose of his own, presumably waiting for Finn to acknowledge his fate. Finn can't - or won't - look up, and he doesn't have to. He knew as the ball hit his pad, and if he didn't know then he knew as the Essex players flew past him. What's remains is a perfect image. NB: H/T to my pal Nick Hogg with whom I discussed this on Twitter. And read Paul Edwards' on the whistle report, which mentions Grayson Perry and John Dee in the intro. Marvellous.